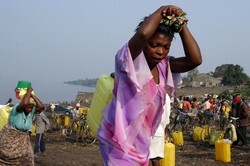 KINSHASA, 25 April 2007 (IRIN) - Civilians fleeing fighting between Congolese government troops and rebel militias in North Kivu Province have been forced to shelter in makeshift camps 100km from Goma town, aid workers said. Thousands of others are living in the bush, hiding during the day and going to their fields at night. Humanitarian sources said thousands of people had been displaced since clashes between the two groups started in January, including more than 64,000 who fled their homes in North Kivu alone over recent weeks. "The deployment of the mixed brigades and repeated clashes between the army and armed groups have caused the displacement of more than 100,000 people in this area," said Andrew Zadel, spokesman for the United Nations Office for the Coordination of Humanitarian Affairs in Goma. The latest fighting flared up on Tuesday as the Democratic Republic of Congo (DRC) troops launched an offensive against Rwandan rebels hiding in the east of the vast country. "The mixed brigades of the army [FARDC] launched a general counter-offensive in North Kivu against the positions of Rwandan fighters of the Forces démocratiques pour la libération du Rwanda (FDLR) and of a group called Rasta," Col Delphin Kahindi, the army commander in Goma military region, Orientale Province, told IRIN. The Forces armées de la république démocratique du Congo (FARDC) is an integrated national army, comprising former rebel fighters, militias and soldiers from the former national army. Human rights groups, however, say the soldiers are responsible for human rights violations in Orientale Province. The Rwandan fighters are accused of perpetrating the 1994 genocide in their home country, before fleeing to hide in DRC. Some are using children to fight for them, according to human rights groups. "The objective of the operation is to push back the rebels towards zones where nobody lives and to secure roads and villages," said Kahindi. The rebels, he added, were already being forced back towards the Virunga national park. The UN World Food Programme (WFP) has distributed more food to 68,000 displaced people in North Kivu and the UN High Commissioner for Refugees (UNHCR) plans to take up reports by victims that armed groups have committed serious human rights abuses with the Congolese military and local authorities. "The latest fighting underlines the need for a strong humanitarian presence in eastern Congo," said Charles Vincent, WFP country director in the DRC. A spokesman for the UN Mission in Congo, Maj Gen Gabriel de Brosses, said 10,000 persons had fled Walungu region in the past three days because of the counterattack against the FDLR and the Rasta. "People are awaiting the end of the military operations; they will then be able to return to their villages," he said. Congolese military authorities acknowledged that ongoing clashes had caused displacements of civilians, but insisted there had not been any significant waves of people fleeing in the last few weeks. "The army has taken precautions in order not to have a massive displacement of [civilians]," Kahindi said. WFP and UNHCR noted that while violence had continued in one part of eastern Congo, stability elsewhere had allowed more than 96,000 refugees to return home. Some had been away for eight years in neighbouring countries. According to the UN, more than 1.1 million Congolese are displaced within their own country by conflict and persecution.